As you know, CLAMP is a four-person group. On the day of the interview, Mokona wasn’t feeling well so we talked to only three members. However, on the following day, when we did the 50 Questions, Mokona participated and thus we were able to record everyone’s answers. How did the series XXXHOLiC come to be? Ohkawa: Well, it started when all four of us decided that we wanted to have a series in which crossovers from all our other stories would be possible. Up until now, our modern-day characters have been able to appear in other modern-day settings, but we couldn’t do that with our characters from fantasy worlds. So we decided to make something in which everyone could appear. There, we made a world in which you could see the mechanics of world-traveling, so that it’d be easier to understand the movements of the world-travelers. We ended up with one story for the world-travelers and a parallel story that followed their movements. The world-travelers’ story became Tsubasa, and the one with the characters watching over the others became XXXHOLiC. So that was our starting structure. 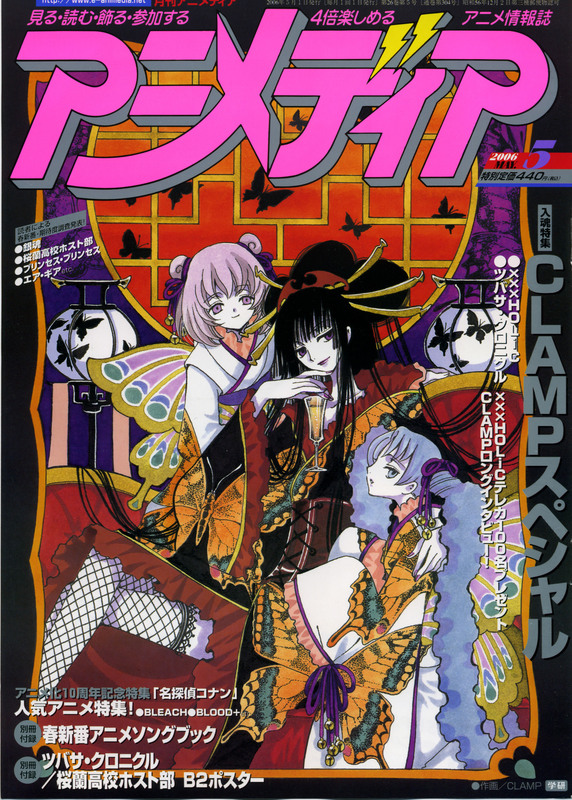 Moreover, before starting XXXHOLiC, we thought that since we’d drawn so many cute girls for Chobits in Young Magazine that we ought to try something else. I see. That must mean that Yuuko-san was the first character to be created. Ohkawa: That’s right. But it’s not as if we’d decided on a character like Yuuko-san. For a while it was going to be a child– we kept changing that. Was there a model for Yuuko-san? Wow, so there’s someone who acts and talks like Yuuko-san! *laughs* So Watanuki and the others were created afterwards. Nobita. *laughs* Is there anyone popular amongst the characters? Igarashi: The vast majority of the female fans go for Doumeki, I think. Ohkawa: Yuuko-san, when she first appeared, was seen as scary. How did you choose the title XXXHOLiC? Ohkawa: This is what happens every time, but we left it to the last minute, when the announcement was going to run in the magazine. Nekoi: Aside from XXXHOLiC, we had also considered “addict”. But we wondered if it wouldn’t be too hard to understand immediately. Since ‘addict’, like XXXHOLiC, has the meaning of someone who’s an addict, the two titles seem to be following the same idea. Ohkawa: In the beginning of the series, there were a lot of stories in which a guest character had to get out of some situation and ended up meeting a cruel fate. Was it intentional to have so many female guest characters? Ohkawa: It is. The spirits too are generally female; for the guys, we have the Karasu Tengu or other spirits with non-human forms. It’s not for any remarkable reason. One reason we did it is because if we added too many male characters, Watanuki, who has a light personality, wouldn’t stand out as much. *laughs* Also, by having the guest characters be female, it makes it easier to distance them from Yuuko-san. As for the spirits, if you look research literature, you’ll see that most beautiful spirits are female, so there’s that too. Please tell which episodes, that have been released so far, left a deep impression on you. Igarashi: In the story where they tell ghost stories (volume two), Himawari — [Translator’s note: due to the blurriness of the scan in this part, I can’t make out what’s written!] I thought that was pretty scary. *laughs* I liked it! Nekoi: In the episode about the hydrangea (volume five), I love how the hydrangea’s voice comes down from above like rain drops. Ohkawa: If I had to pick only one, then it’d be the story with the Fox Oden-ya (volume 3). In the wintertime, more than large-scale stories, I prefer to write shorter tales like that one. Let’s move onto another subject. I think that it must be very difficult to serialize two weekly series, could you please tell us about your work schedule for one week. Ohkawa: I show up on Monday morning, write the script, and then hand the relevant storyboard to those in charge of them. For Tsubasa, a script can take about five hours and the Tsubasa storyboard about ten. Igarashi: After that, we have to draw the manuscript, which takes about two days for twenty pages. There are also times when we’re not doing so well and it takes us three days. Ohkawa: In the meanwhile, I work on an anime script or on XXXHOLiC. Nekoi: By Thursday we have to start working on the XXXHOLiC storyboard, which takes some 6 to 8 hours, and have that done by Saturday. Igarashi: The last day is for things like drawing the color pages. If there is no such task that week, we get the day off. Since the anime is starting, there’s a lot of color pages to be made. With what materials are you drawing XXXHOLiC? Nekoi: Felt-tip pens. That’s because the human characters are being drawn by two different people– if we used a pen, the brushstrokes’ strengths would be uneven. When you start a new series, do you run tests to decide on its visual characteristics? Igarashi: We do. We draw trial-run manuscripts and sometimes we try printing them out to see what works. Nekoi: With XXXHOLiC, for the sake of the world view, we draw it without any screen tone. This is a stupid question, but why did you think to link Tsubasa and XXXHOLiC? Ohkawa: In the TV Drama Twin Peaks and the movie Blair Witch Project, it’s fun even if you watch them as stand-alones, but if you read the books explaining them and the information uploaded onto the internet, they’re even more enjoyable. In the same way, a series should be enjoyable on its own, but we wondered if there couldn’t be some other approach. That’s how we reached the idea of having different series that are fun on their own but that are even better if you know the connection between them. Igarashi: We think that the impressions of Yuuko-san, who is in the sections featuring the link, must be different from those that read only XXXHOLiC or only Tsubasa. Please tell us something about the anime side of things. Ohkawa-san, who is writing the scripts for the anime as well, how many are you being made to write? Ohkawa: Every week, I go to PRODUCTION I.G’s studios. I generally keep my hands off of the anime, taking on the position of a mere observer. This time, however, there have been some episodes with scenarios difficult to convert and I’ve been asked to be in charge of that, so afterwards I have to be around to confirm the setting. …With that, I have to write another three scripts. *laughs* So altogether it’s four scripts. What are the differences between writing the original manga and for the anime? What kind of person is the director Mizushima? Ohkawa: He loves cute things. *laughs* Like with Doumeki, he’ll raise his hand and say he wants to do it, and he’ll write the script and plan the framing himself. Also, I think due to his experiences with Crayon Shin-Chan, he’s always thinking about how to make the story’s contents reach as large an audience as possible. Igarashi: Nekoi took charge of that. She listened to the many tapes that were sent us and we listened to only the ones she picked out. Nekoi: Though Fukuyama-san speaks fast, he is pleasant to hear, and he sounds honest without being overly naïve, so we picked him. As for Doumeki, we picked Nakai Kazuya because he balances with Fukuyama-san. Ohkawa: With Yuuko-san, we went on a quest to find someone who wasn’t strongly associated with another character. Nekoi: We also wanted someone with the feel of western movies. The one to unite all those qualities was Ohara-san. As the last part, tell us your highlights from the XXXHOLiC anime! Ohkawa: Doumeki and Zashiki appear more often than in the original. *laughs* In making the anime, we did not adhere strictly to the original, and there are small changes throughout. Waiting for those small changes is the best part, I think. “The story with the Fox Oden-ya.” “Oden-ya” can mean either “person who makes/sells oden” or “store that makes/sells oden.” Oden is a Japanese dish in which several, mostly sea-food based, ingredients are stewed together in a light broth. “His experiences with Crayon Shin-Chan“: Crayon Shin-chan is an anime/manga about a boy in kindergarten that’s popular with all age groups. Interview originally published in Animedia magazine (Gakken Plus), May 2006 issue, released on May 01, 2006.